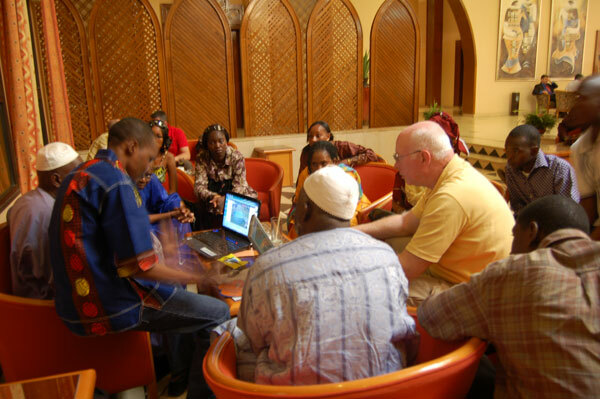 Assistant professor of curriculum and instruction Jim Hynes met with Mali agriculture students at the University of Bamako in March as part of a United States Department of Agriculture grant that promotes educational leadership, agricultural and technological training in the West African country. Five Sam Houston State University College of Education professors and students will give Mali natives lessons this summer that could improve their way of life. As part of a United States Department of Agriculture grant, the SHSU representatives traveled to Mali, West Africa, in March to select five individuals to come to America in July for educational leadership, agricultural and technological training that they will take back to Mali to share with farmers, extension staff and technical school teachers. The training will take place at SHSU and in the Amish country of Southern Indiana, where they will specifically be taught how to harness animal power, according to Sam Sullivan, professor of curriculum and instruction. Sullivan, assistant professor of curriculum and instruction Jim Hynes, assistant professor of special education Ruth DeBar and graduate students Julia Macklin and Terri Sanders spent several days selecting the participants, which include a University of Bamako student, the head of the farmer’s union for the southern region of Mali, the head of the manufacturing plant, and an assistant to the minister of agriculture. 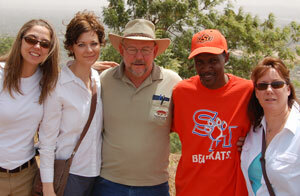 From left: Ruth DeBar, Julia Macklin, Sam Sullivan, and Terri Sanders, with Assoumane, a Mali interpreter. The three professors, and possibly other graduate students, will return to Mali in December to assess the progress being made there and to continue to develop additional instructional procedures. In addition, the group facilitated a “memorandum of understanding” between SHSU and the University of Bamako that will allow for the exchange of information and, hopefully, eventually faculty, Sullivan said. There are approximately 70,000 students at the University of Bamako. Also as part of the agreement, a University of Bamako student will come to SHSU to participate in technological work with the educational leadership and counseling department. The memorandum is mutually beneficial for both universities, as it would allow for an internationalization of curricula and an exploration of collaborative projects, as well as “broaden our horizons” by exposing each to the cultures of the other. The USDA grant was intended promote the interrelationship between Mali and SHSU. After the completion of this grant, the college will begin work on another USDA grant that is “built on this particular process,” Sullivan said.